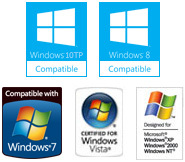 If your questions concerns Windows Vista please note our latest version is Windows Vista compatible. Before contacting support it is important that you have read through the FAQ to see if your question has already been answered. Questions that have already been addressed in the FAQ will take longer to receive a reply, so if your question is urgent, verify that it has not already been answered. If your question has not been addressed you will need to include your registration email to verify that you are a registered user in the box below before sending an email. Before contacting support it is very important that you have read through the FAQ to see if your question has already been answered. Questions that have already been addressed in the FAQ will take longer to receive a reply, so if your question is urgent, verify that it has not already been answered. You will be required to include your system report information, without this we will not be able to give you support. You can find this by selecting View >System Info from within Alcohol Software and copy and paste the information in the box below.